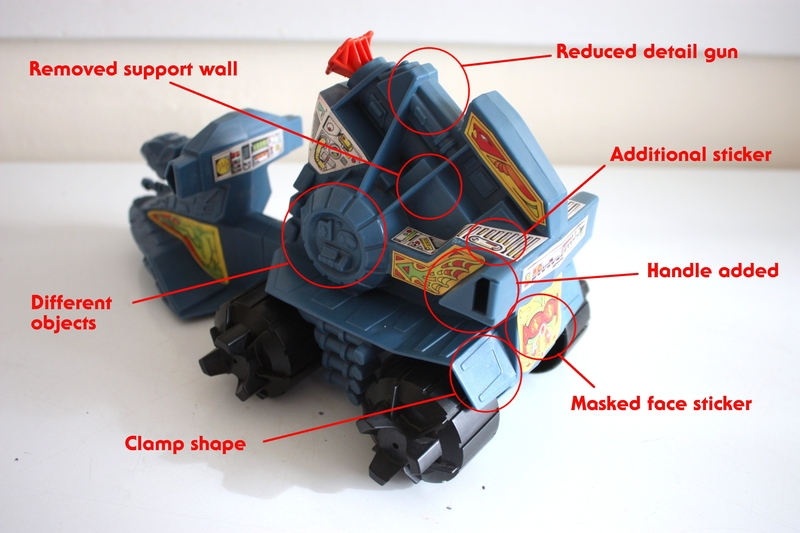 In this post I’d like to take a closer look at the Battle Ram prototype. 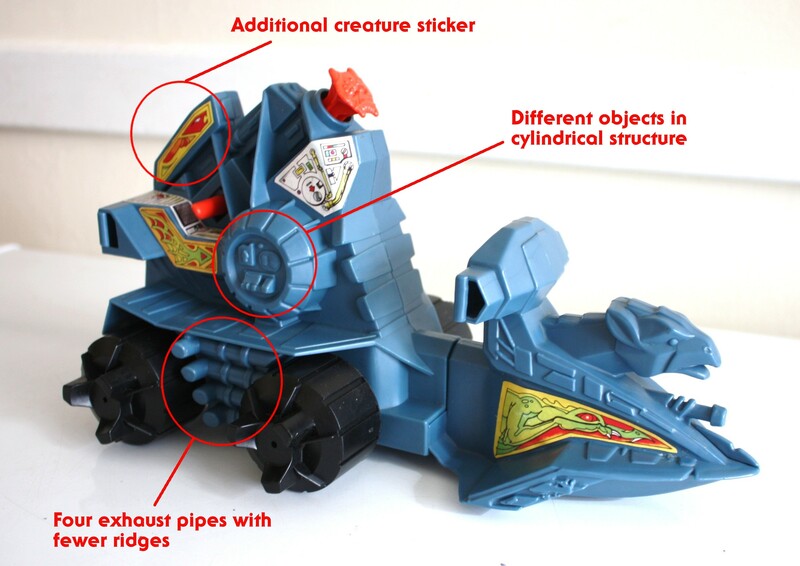 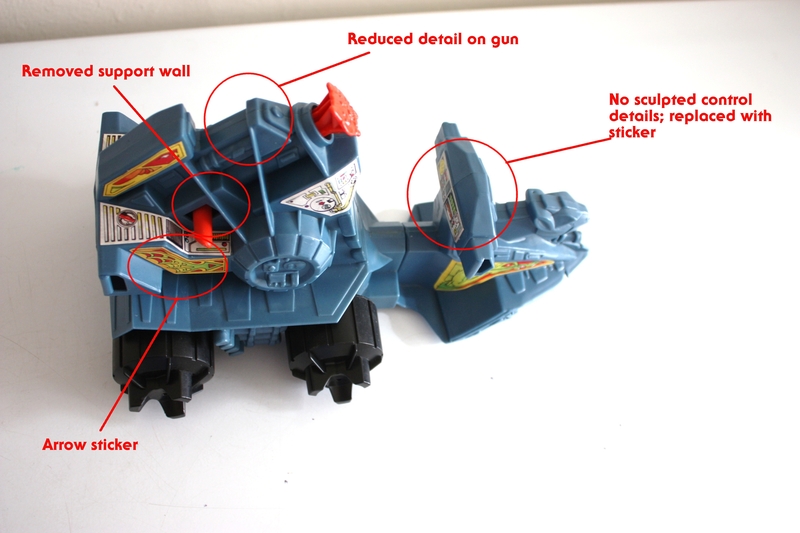 For a more exhaustive treatment of this vehicle, see the toy feature. 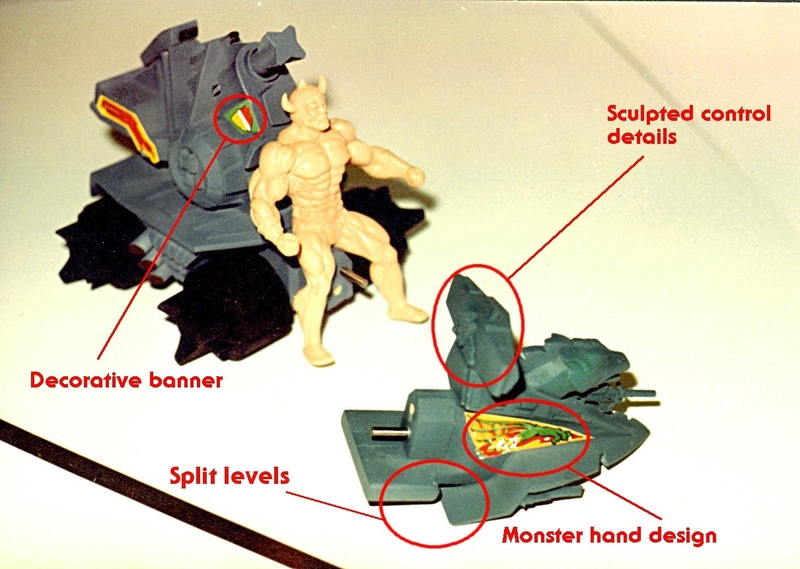 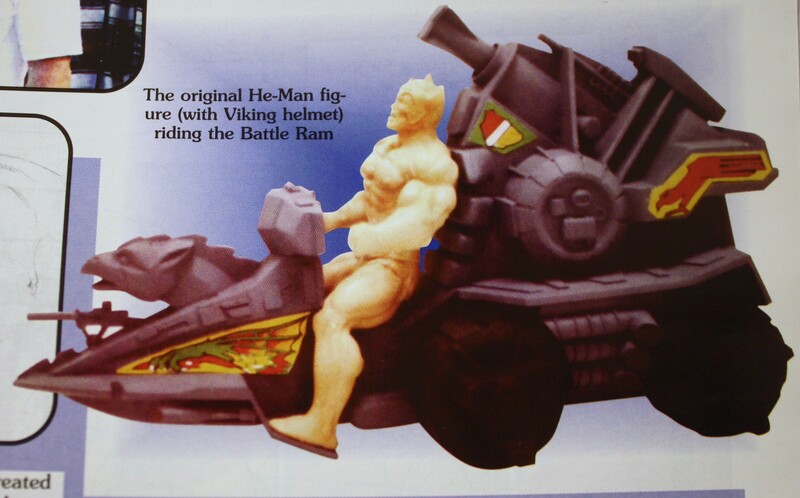 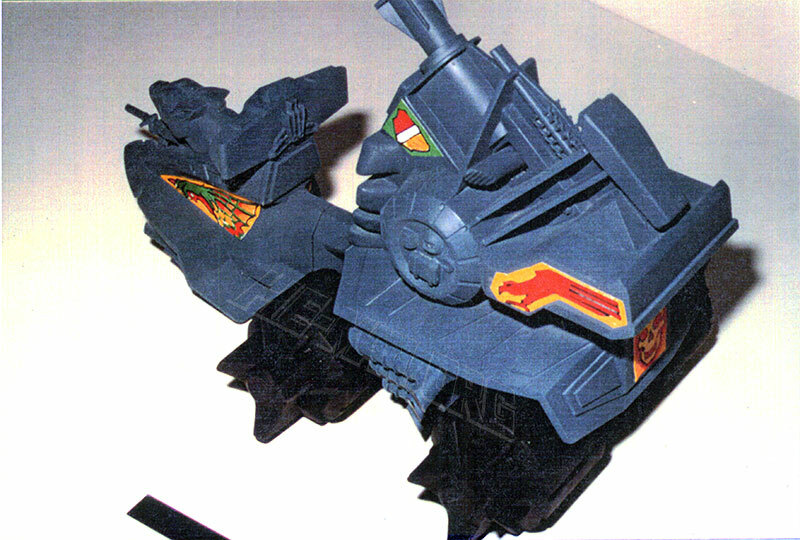 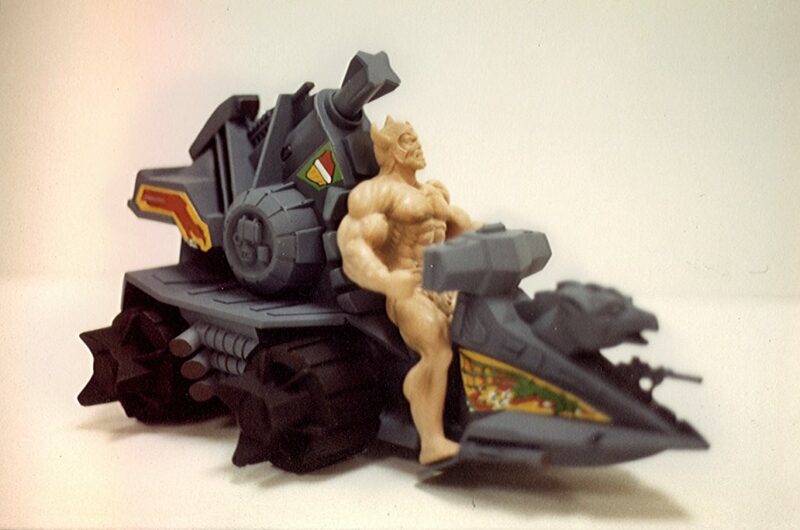 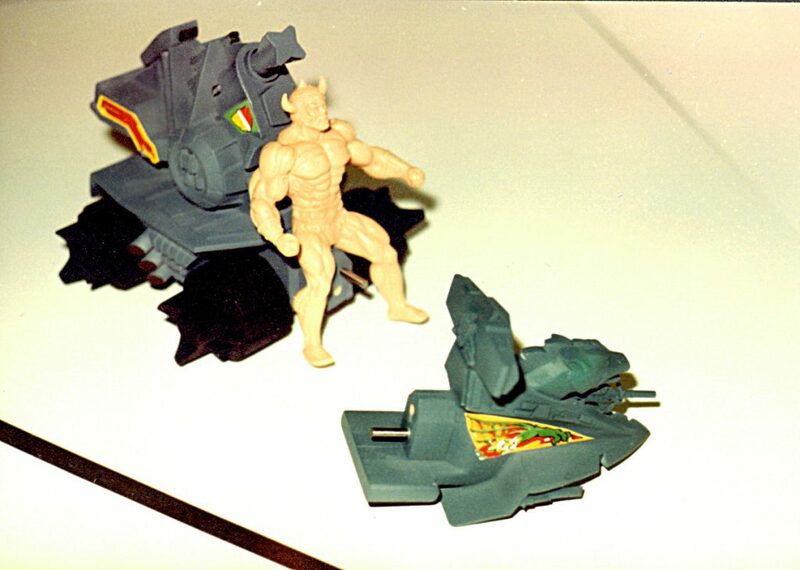 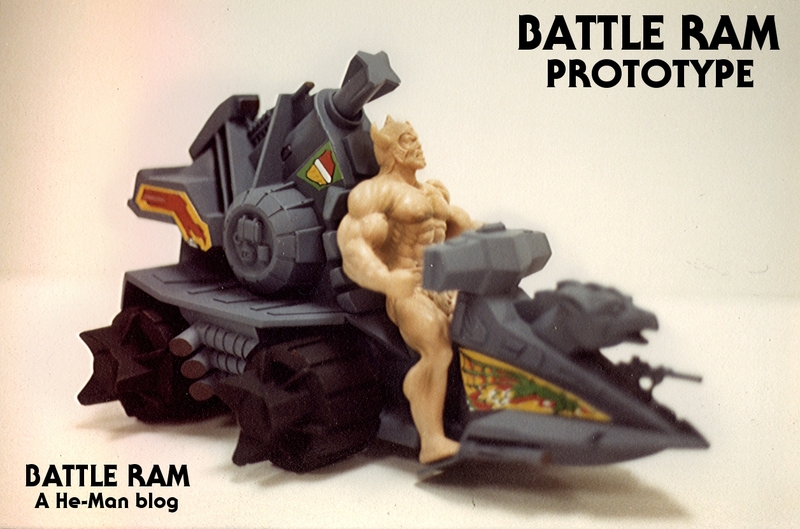 Designed by Ted Mayer and sculpted by Jim Openshaw, the Battle Ram prototype was in some ways more impressive than the final toy. 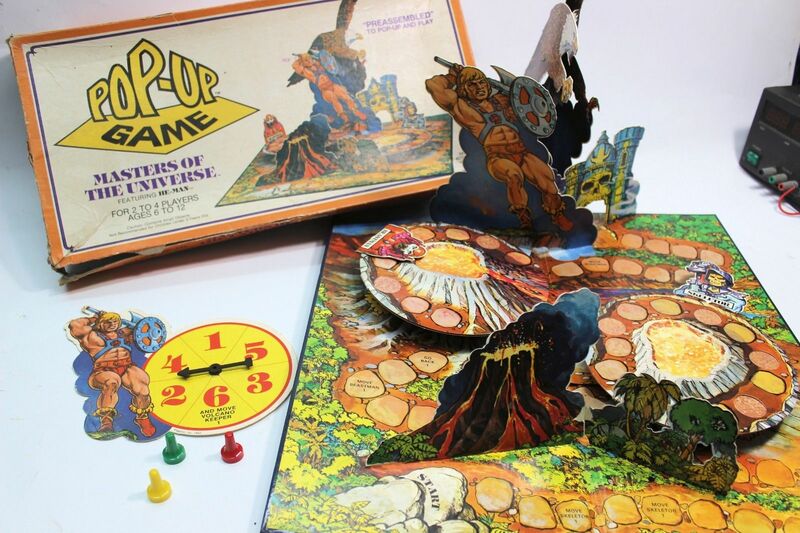 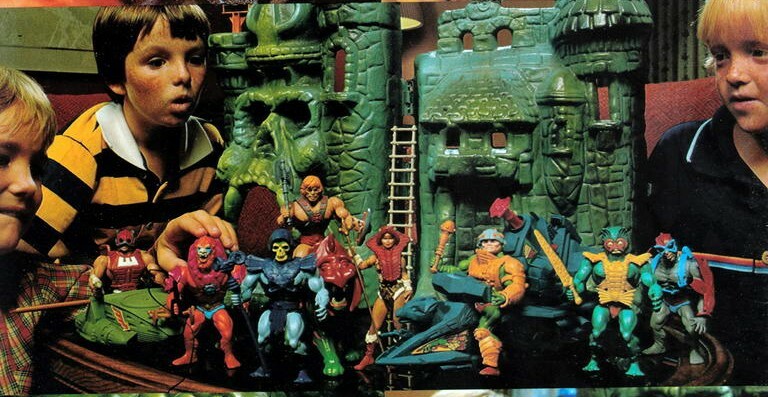 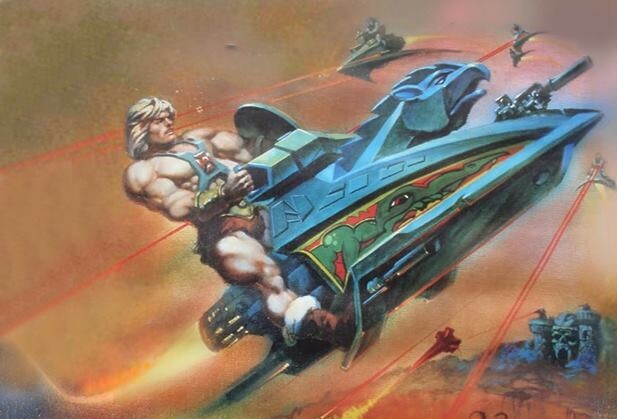 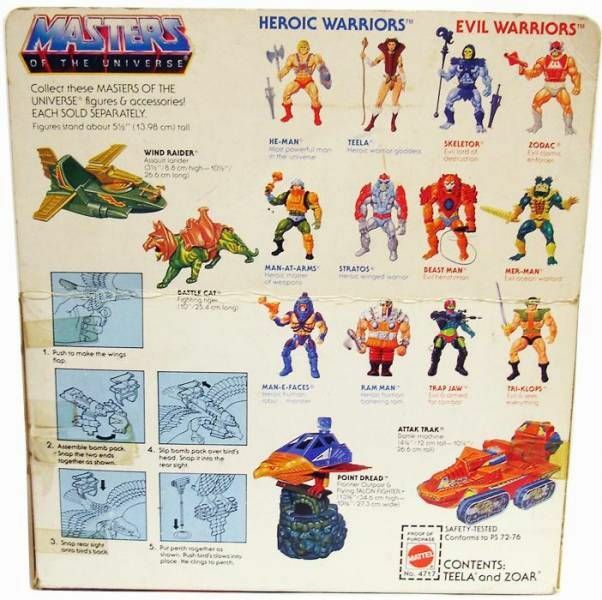 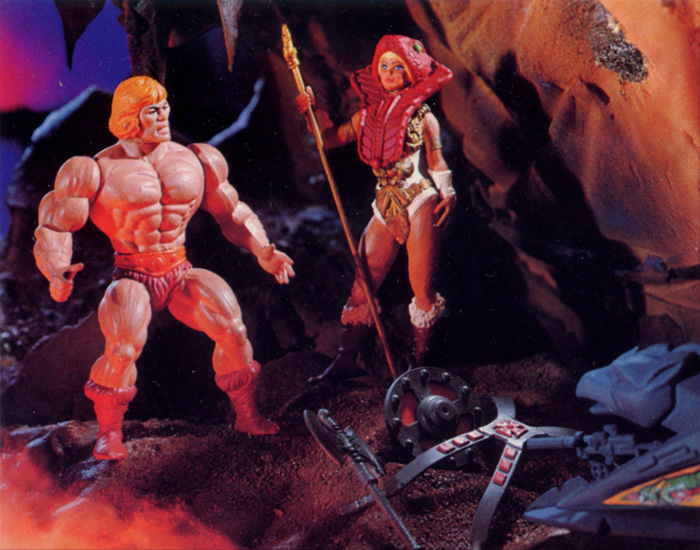 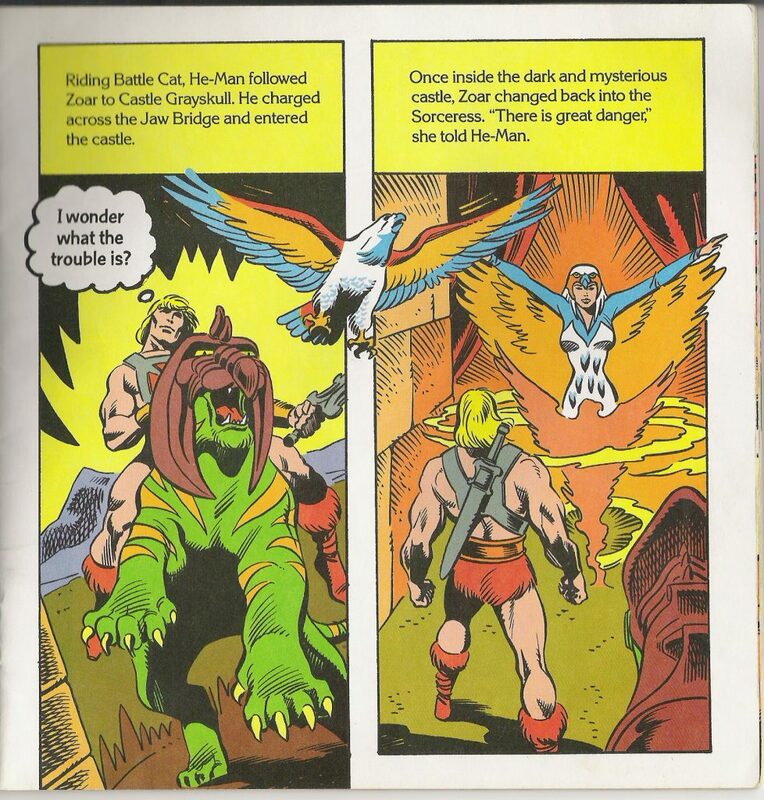 Images 1, 4 and 5 are courtesy of Ted Mayer; images 2 and 3 were retrieved from He-Man.org. 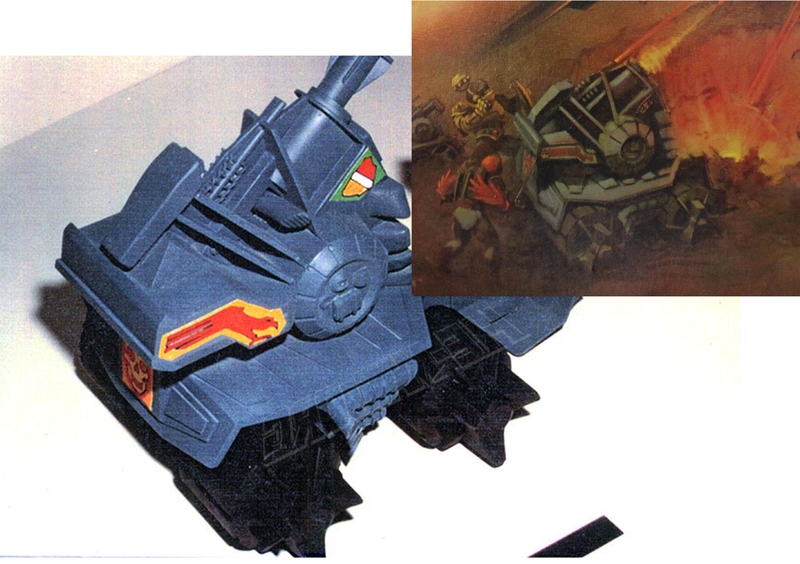 Notice in the fifth prototype image, the front half of the Battle Ram seems to have a greenish tint (in most images it looks grayish-blue). 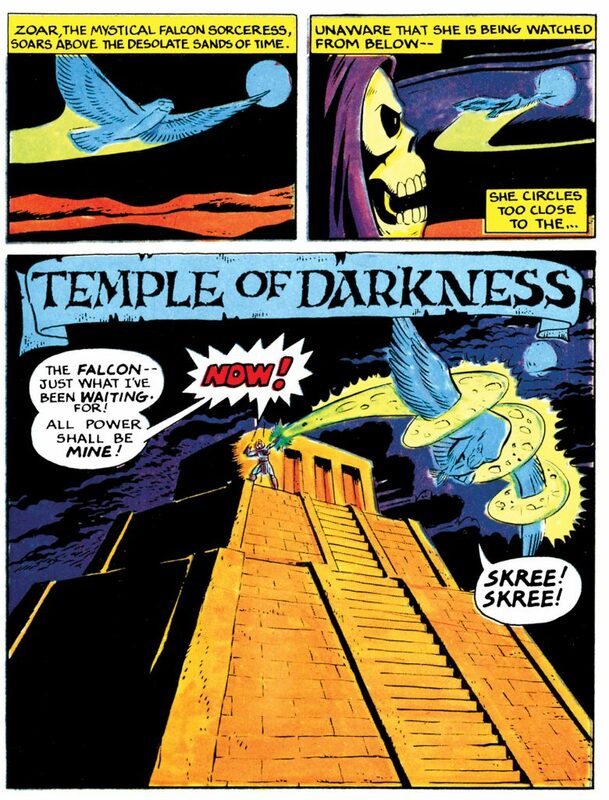 Perhaps the paint took on that tonality depending upon the lighting. 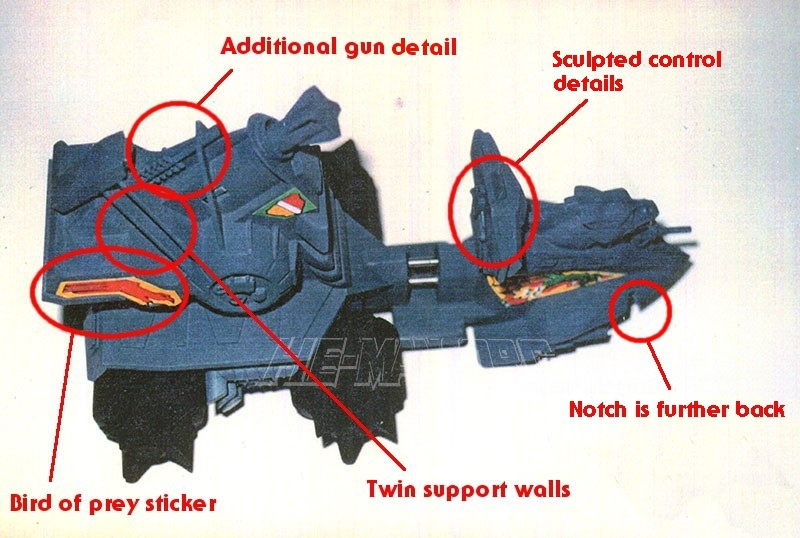 That might explain the greenish coloration of Rudy Obrero’s illustration for the Battle Ram packaging. 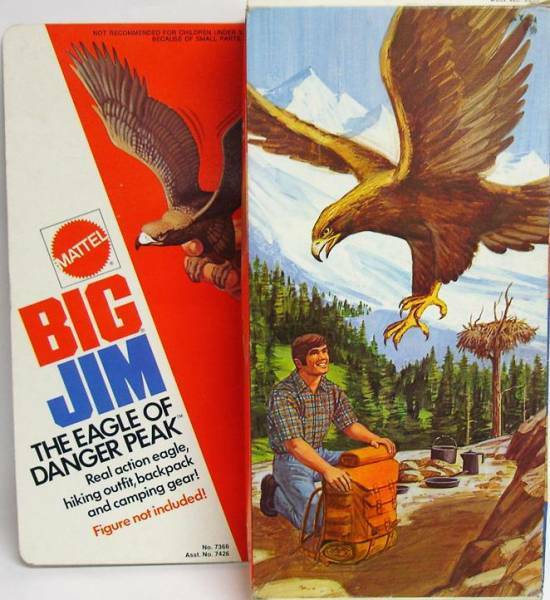 On the other hand, his color choice may have been determined by the lighting in his landscape. 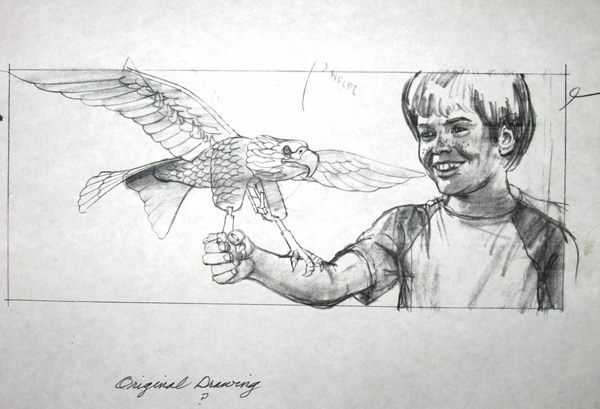 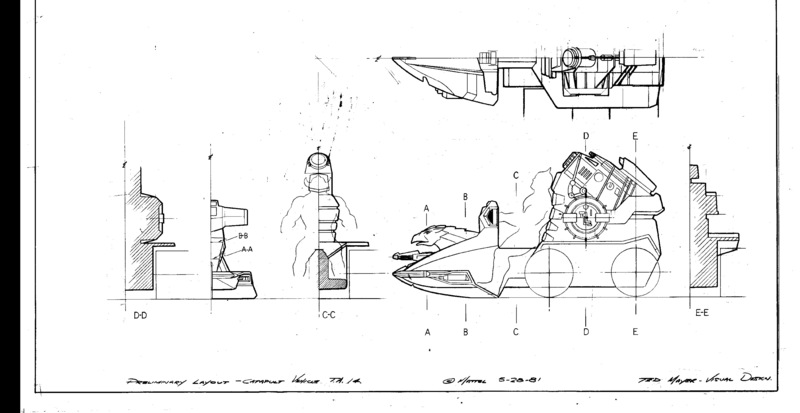 The prototype was very likely based on this control drawing dated May 28, 1981, drawn by Ted Mayer. 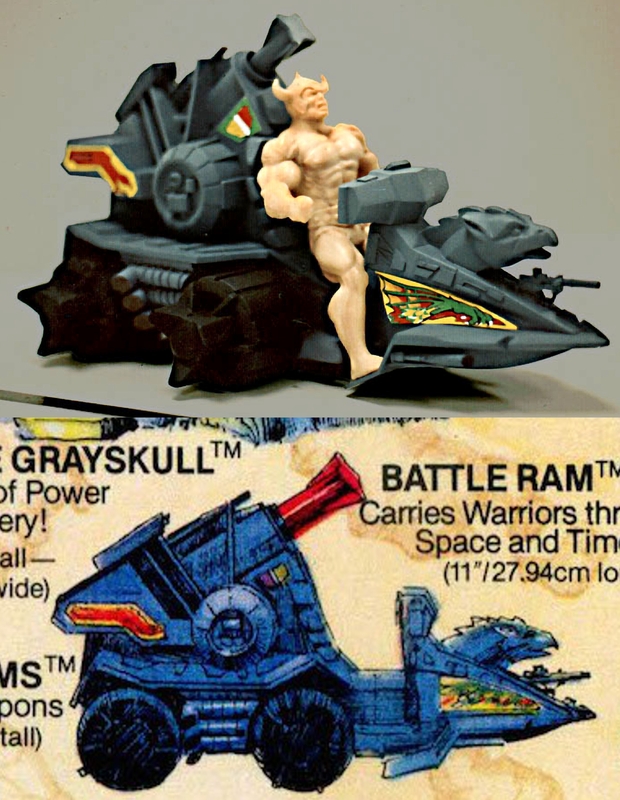 It matches up almost perfectly with the prototype Battle Ram. 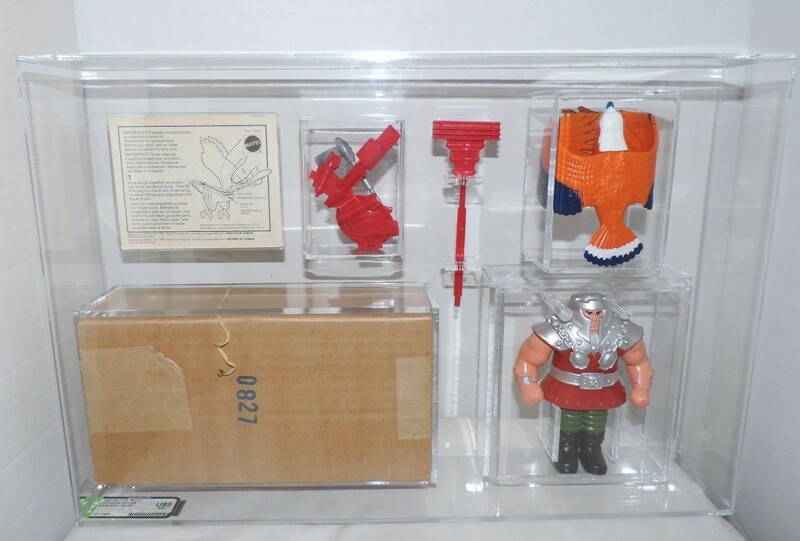 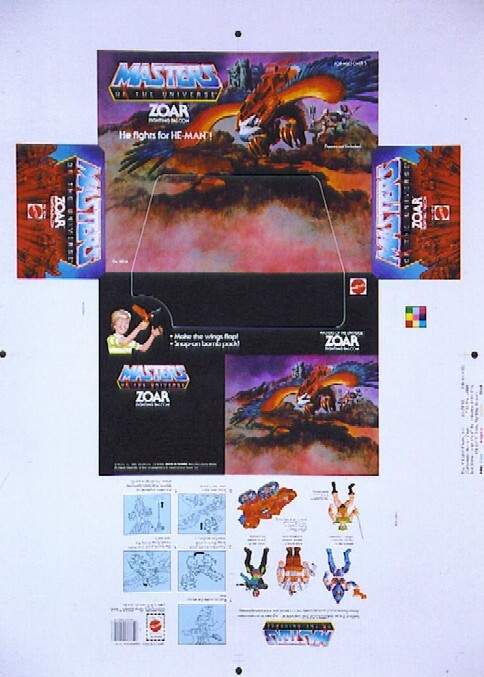 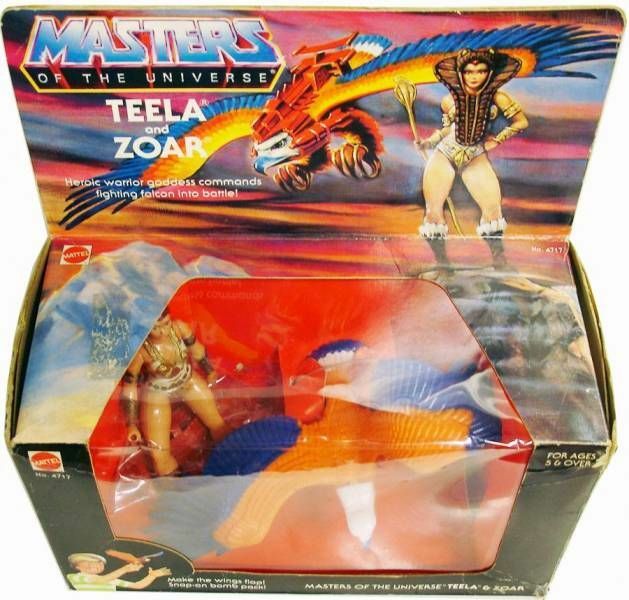 Zoar, released in 1983, is at once a toy with a fascinating history and a character with a conflicted set of origins. 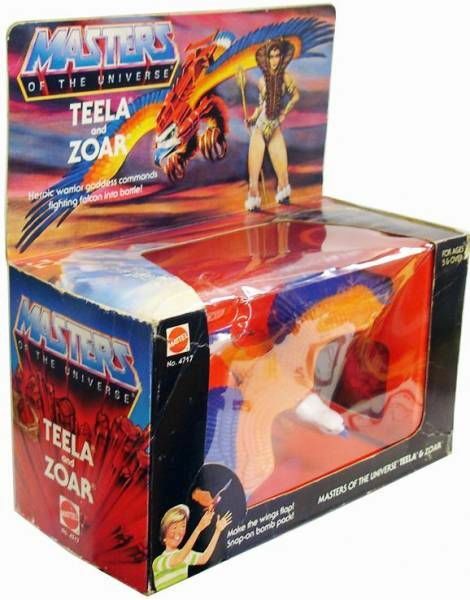 I was given Zoar as a birthday gift along with Ram Man and Man-E-Faces. 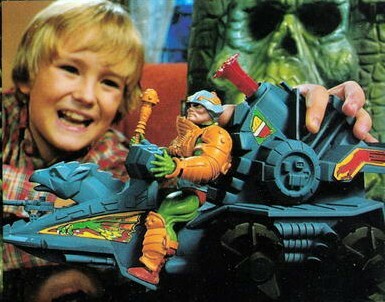 I had endless fun zooming around the house with him. 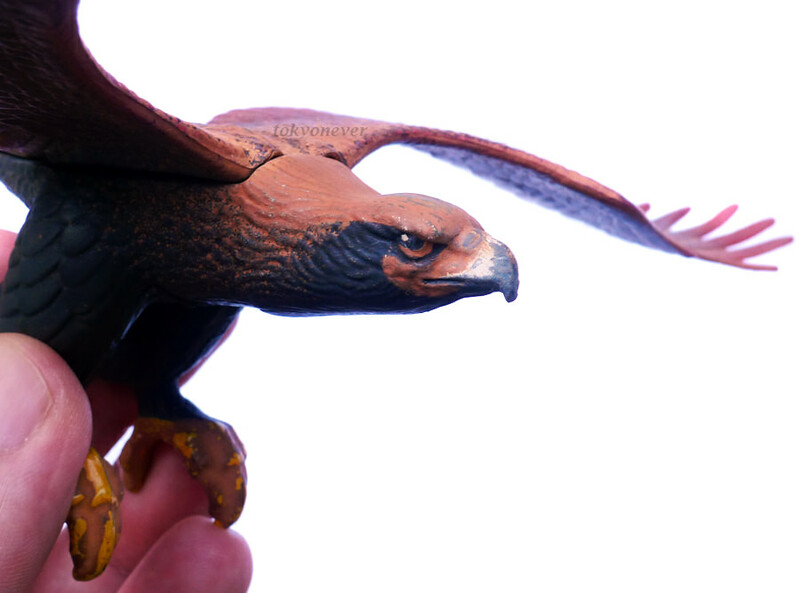 There was something fascinating to me about the rubbery texture of his wings and his surprisingly effective wing-flapping action feature. 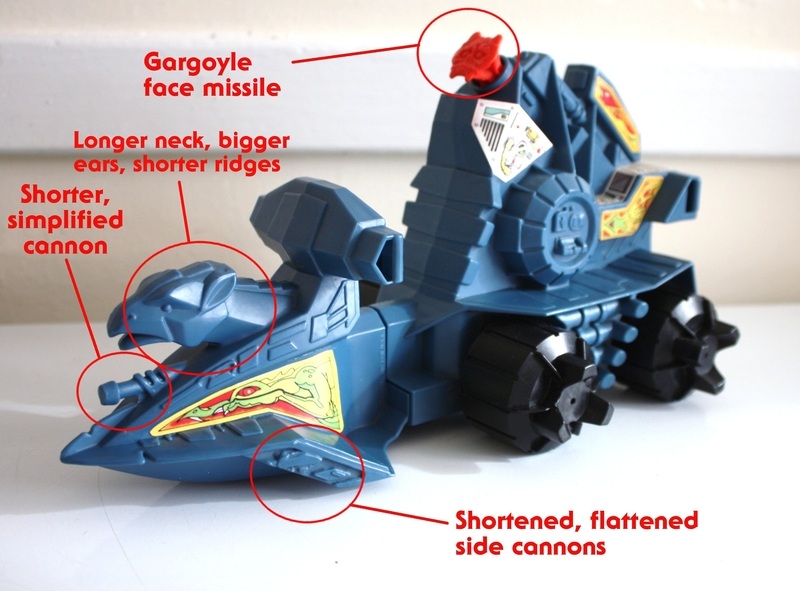 Like Battle Cat, Zoar was made from a previously existing mold. 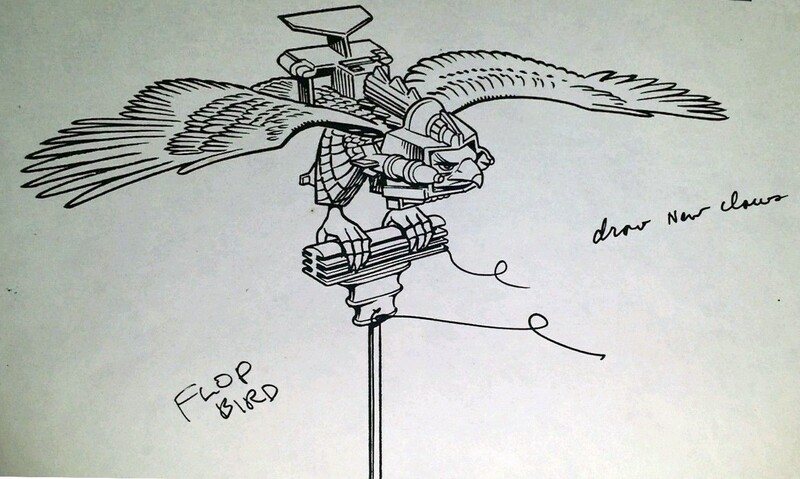 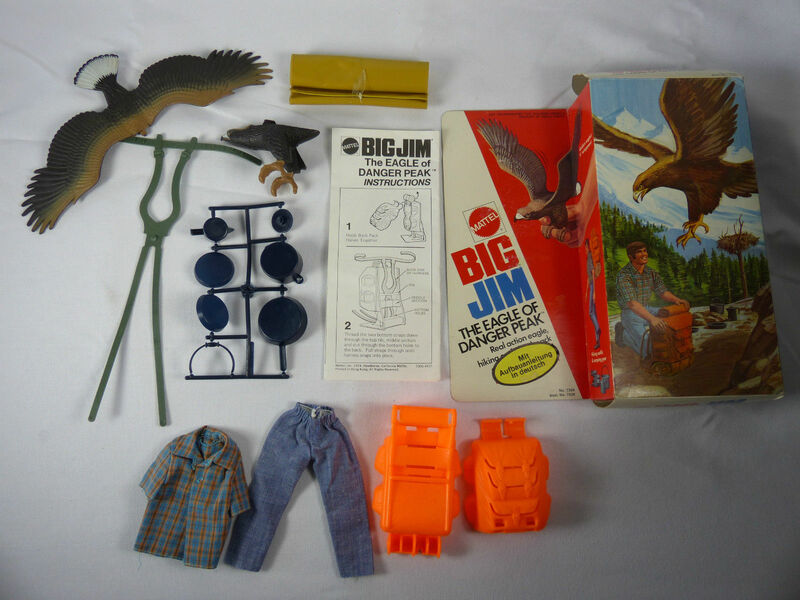 The Fighting Falcon started life as The Eagle in the Big Jim toy line. 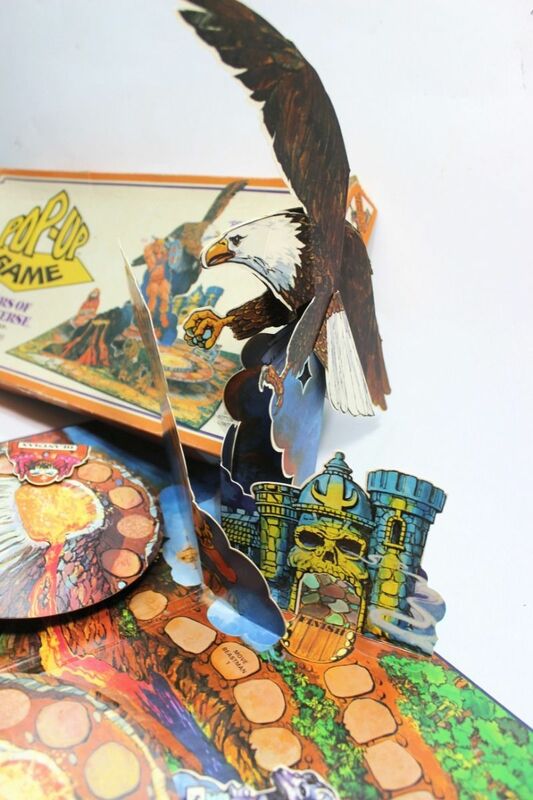 Released in 1973, the Eagle featured realistic colors and was packaged in several different configurations. 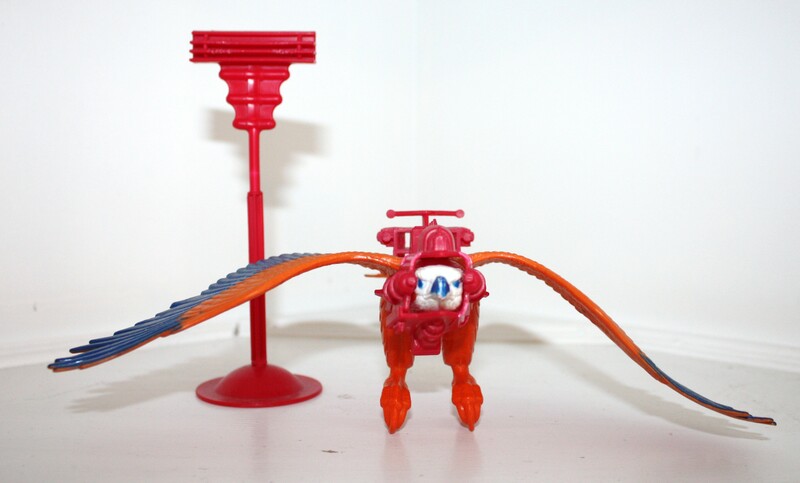 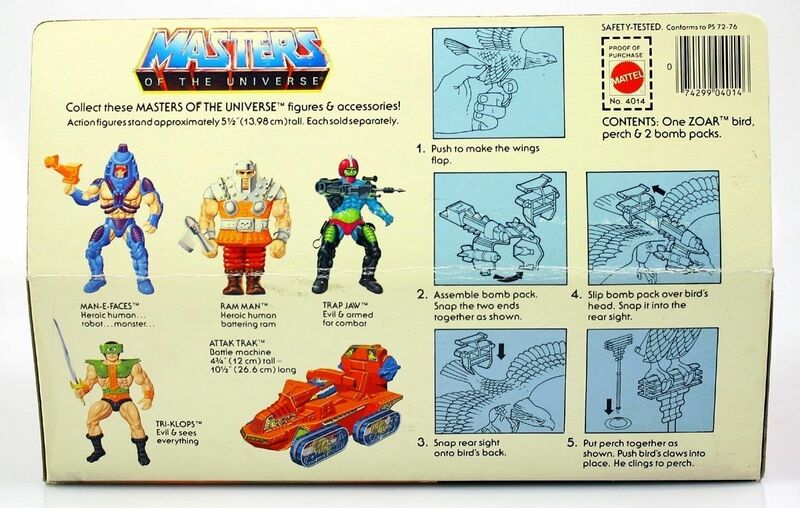 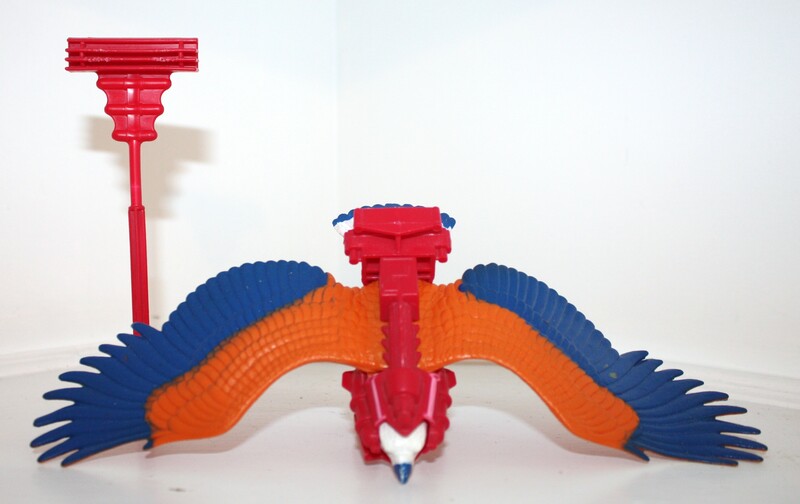 The final toy was given a much more colorful paint job, with orange wings and body and blue and white accents. 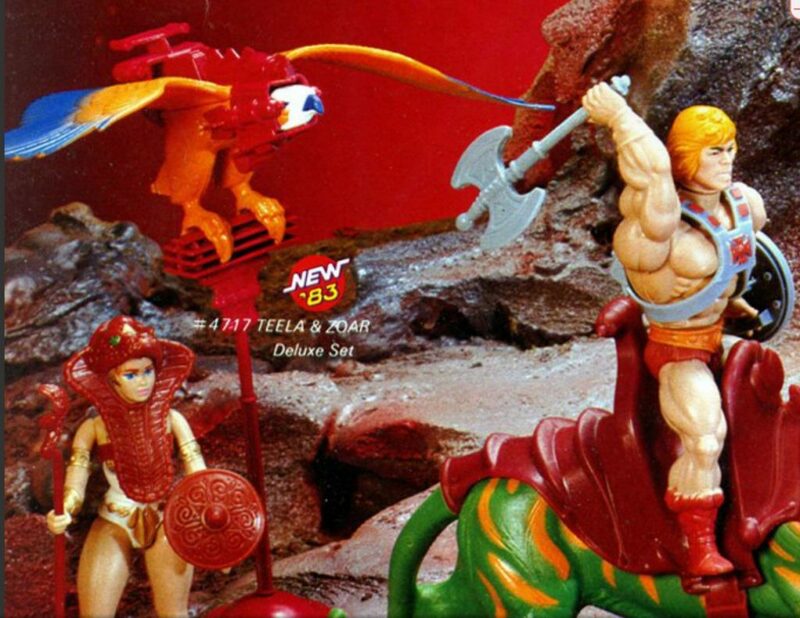 His stand and bomb pack were a bright red instead of the original green. 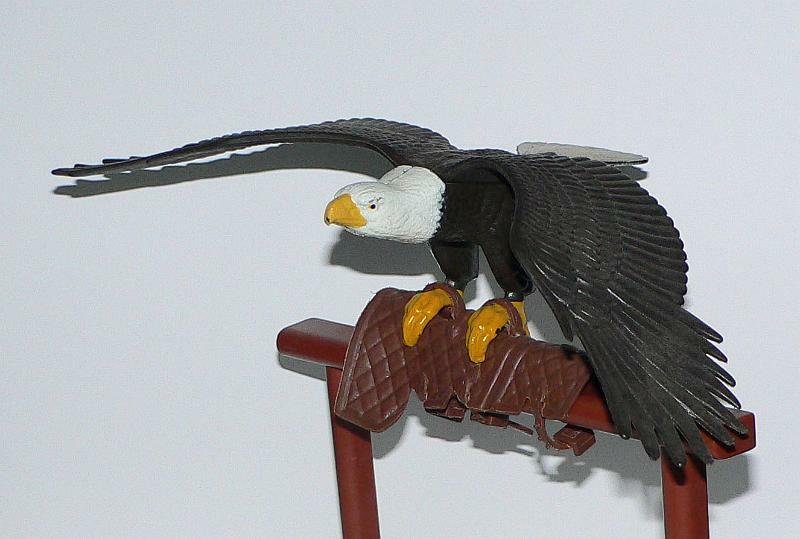 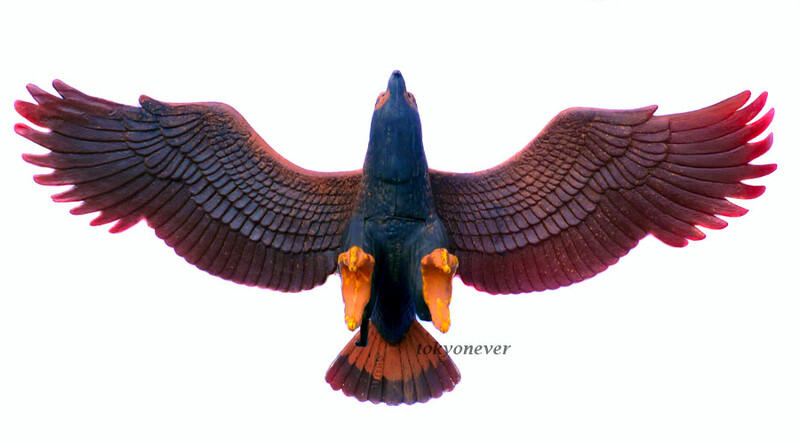 As with his Big Jim ancestor, a lever on the back of Zoar’s legs could make his wings flap. 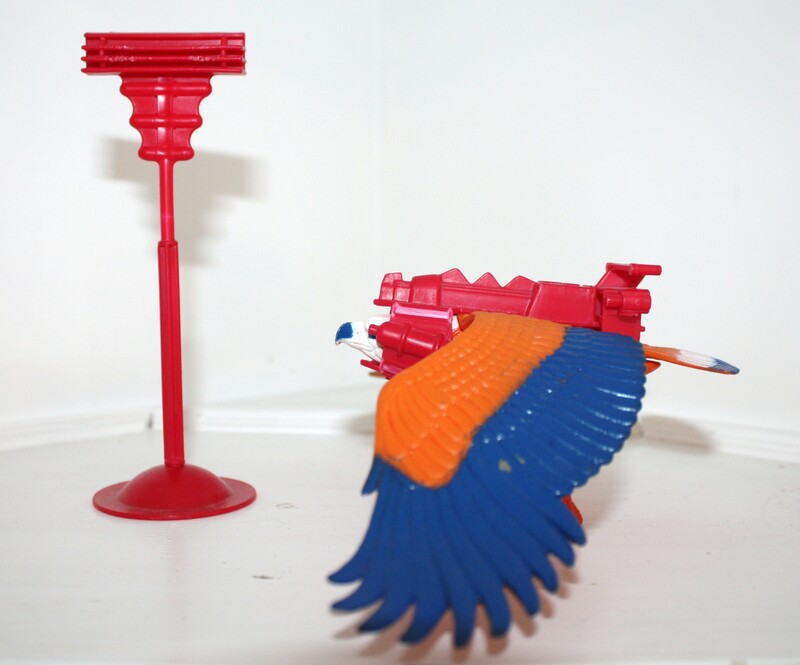 His red bomb pack somewhat hindered the movement of his wings, but it was removable. 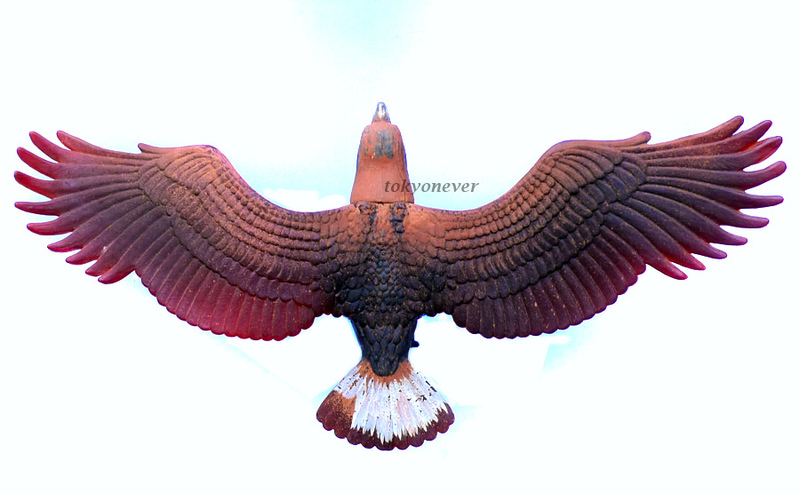 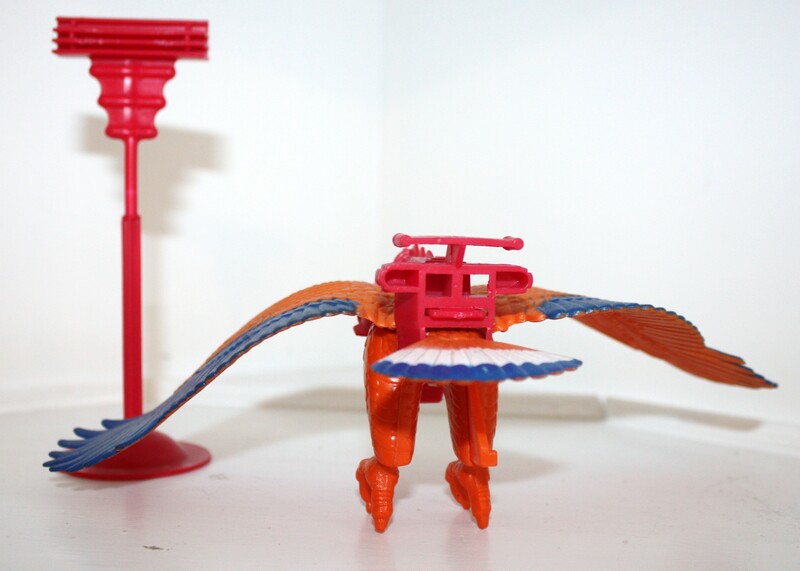 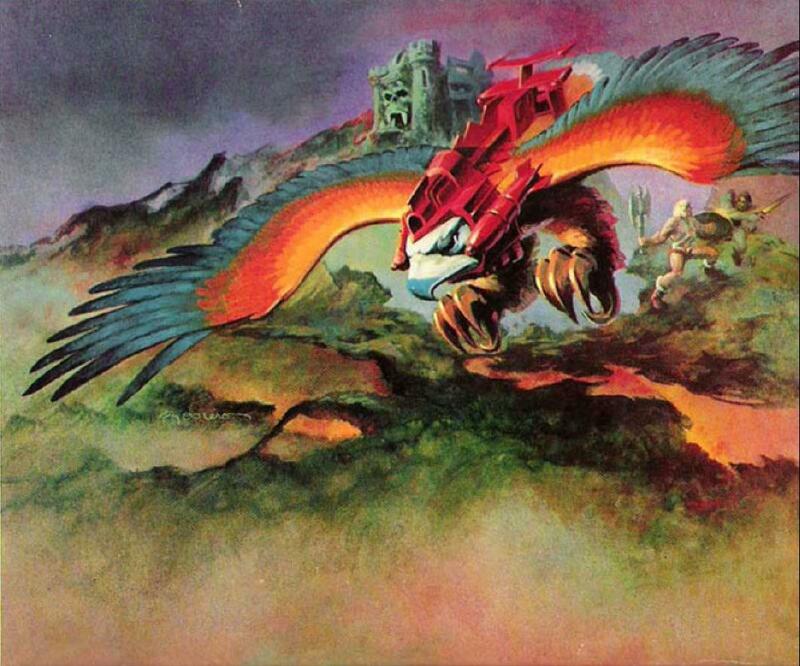 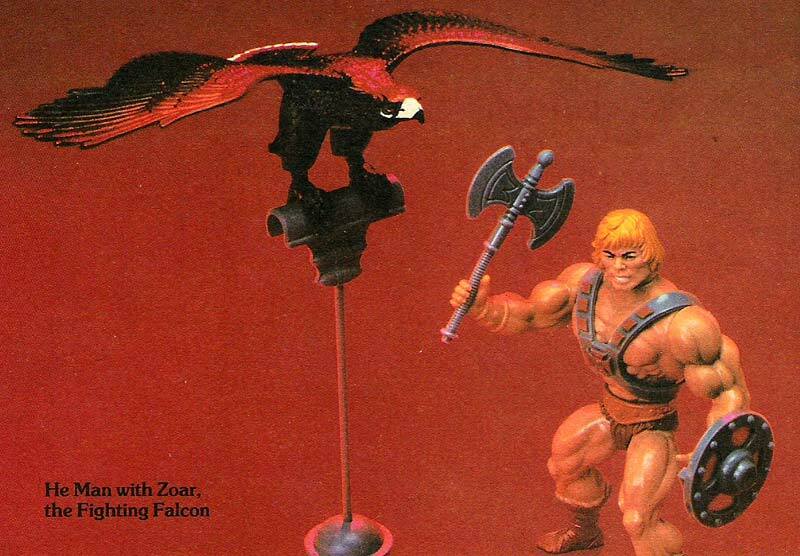 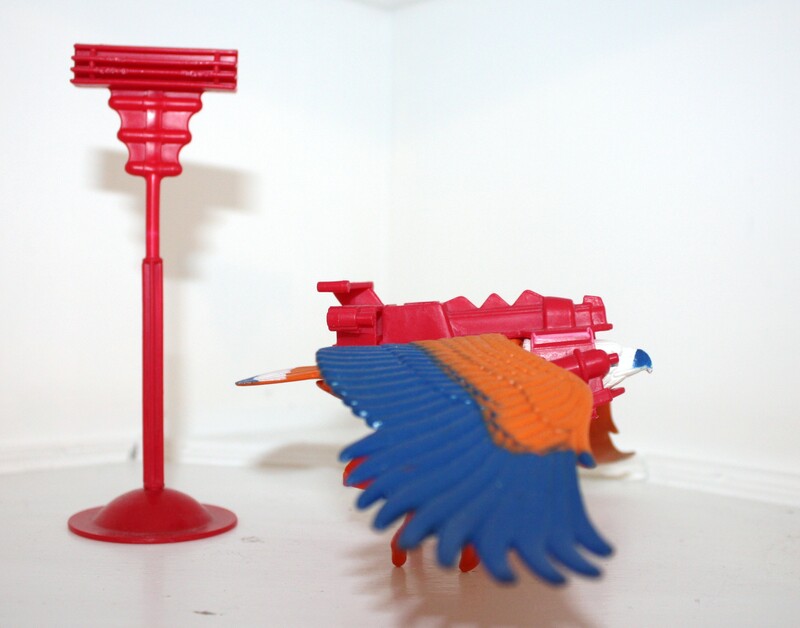 Interestingly, in the early 1970s Mattel produced a flying eagle toy named Zorr (thanks to Tokyonever for pointing that out). 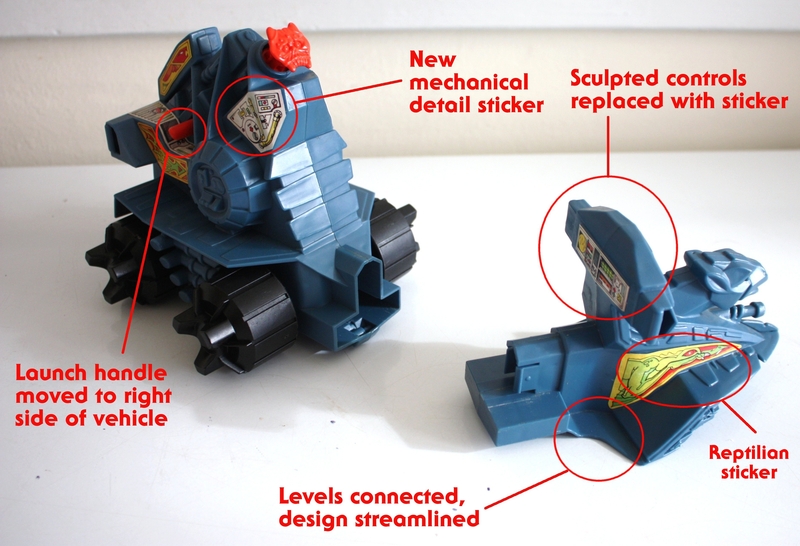 So the name as well as the figure seem to have been recycled from a decade earlier. 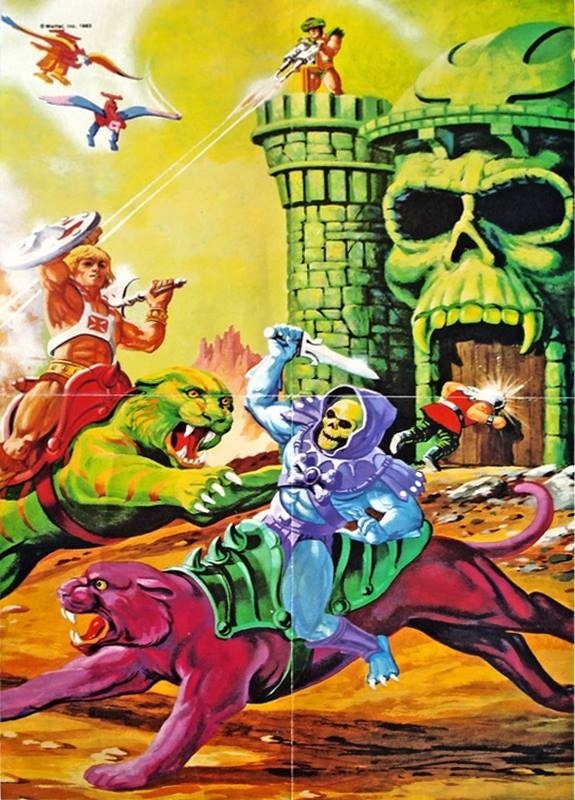 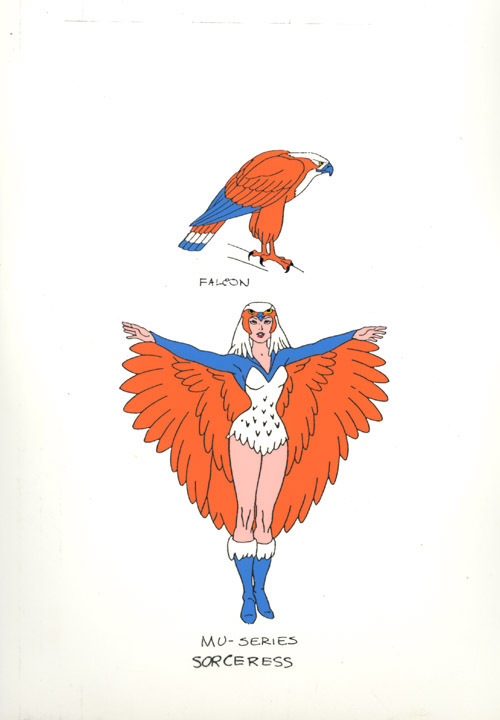 Although Zoar had sometimes been associated with the Sorceress (the version with snake armor from pre-Filmation comic books), it was Filmation that made them quite literally inseparable. 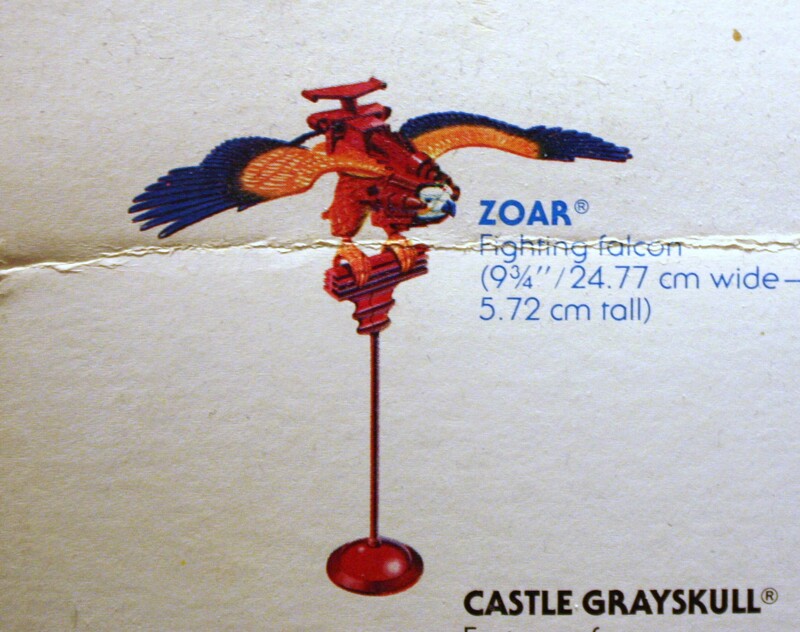 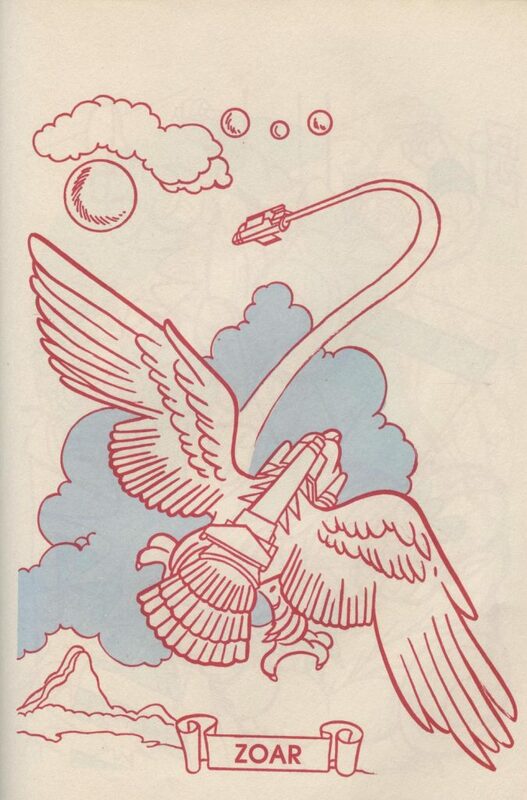 In the Filmation Series Guide, it’s made clear that the Sorceress can only leave Castle Grayskull in falcon form – as Zoar. 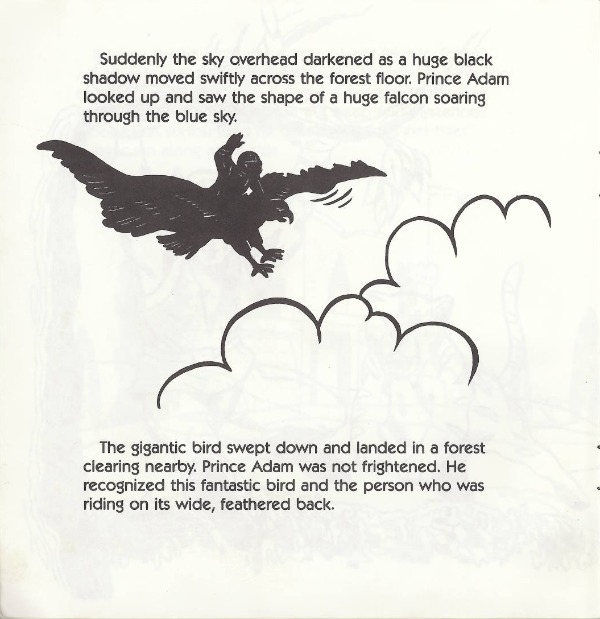 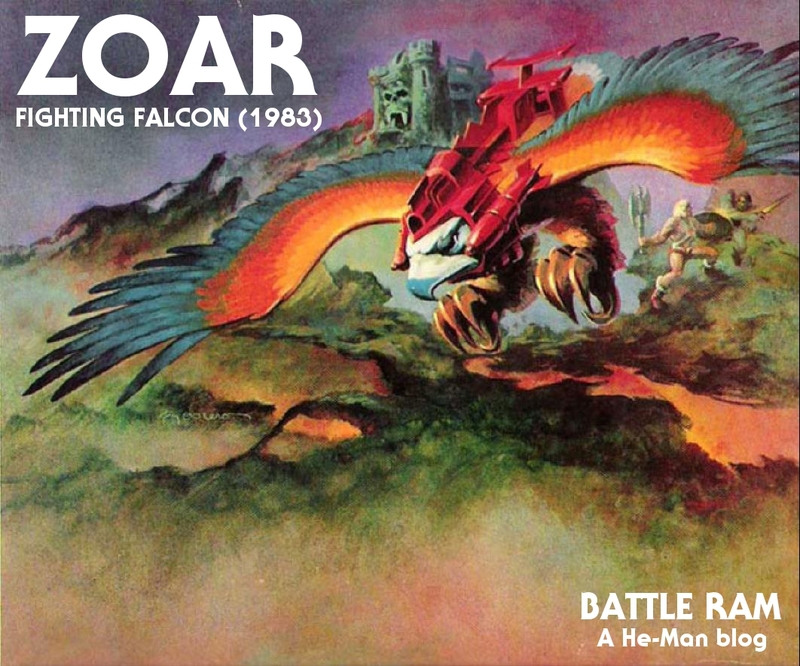 Until the debut of the Filmation cartoon, Zoar had always been referred to as a male falcon. 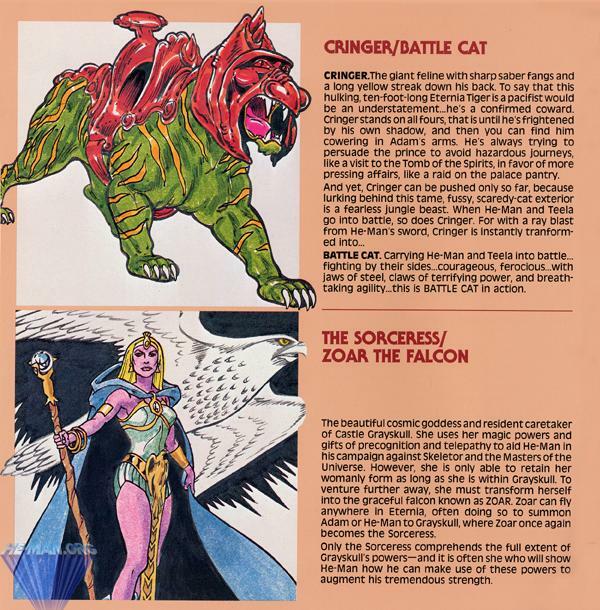 The Series Guide design for the Sorceress is quite radically different from both previous and final designs, of course. 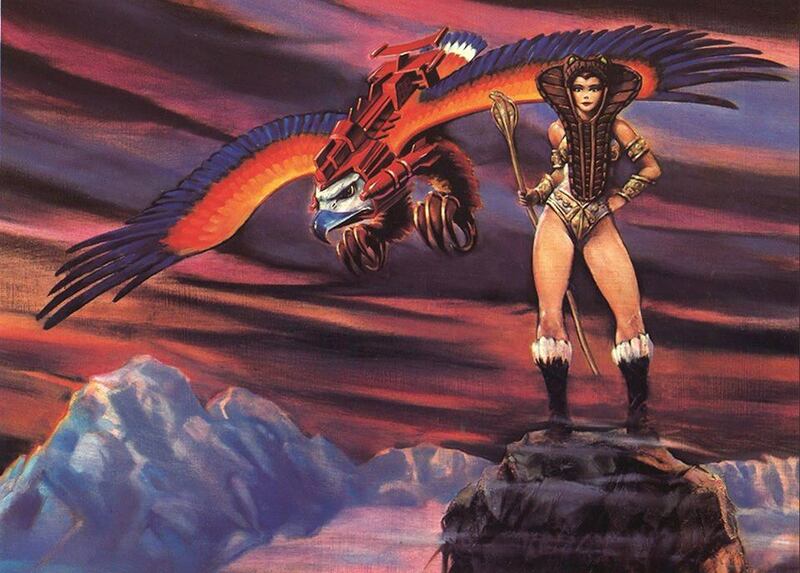 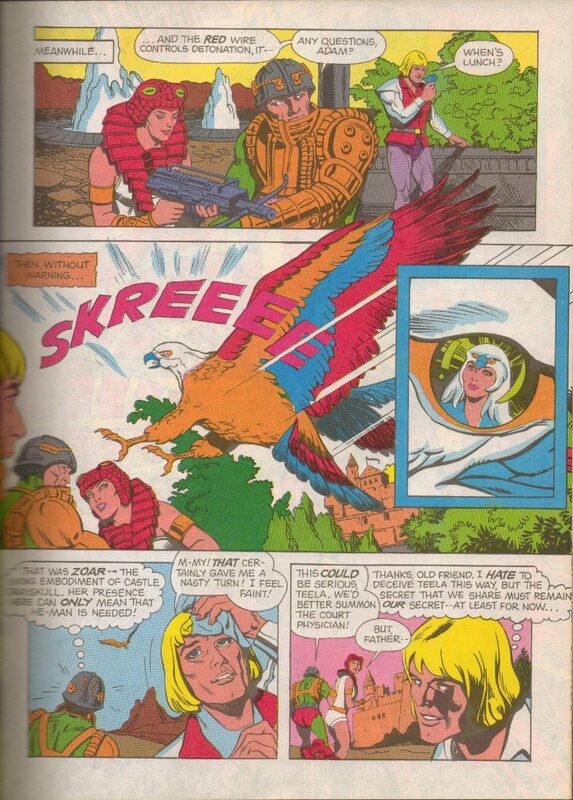 Presumably they were trying to move away from the snake armor version of Sorceress, to avoid confusing her with Teela. 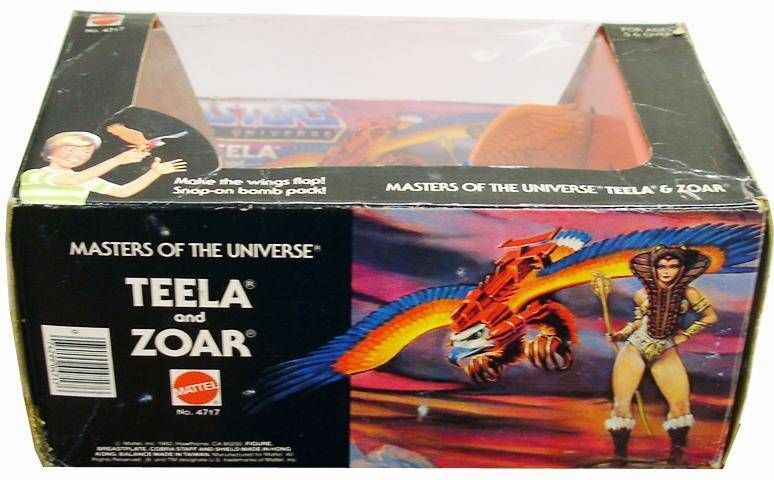 The Filmation cartoon eventually settled on a design for the Sorceress that followed the cues from the toy version of Zoar. 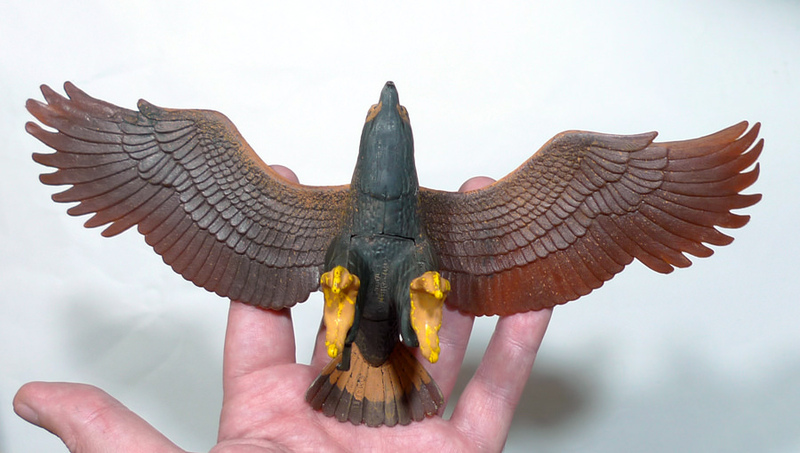 Her costume had orange wings, with blue tipped feathers and white accents. 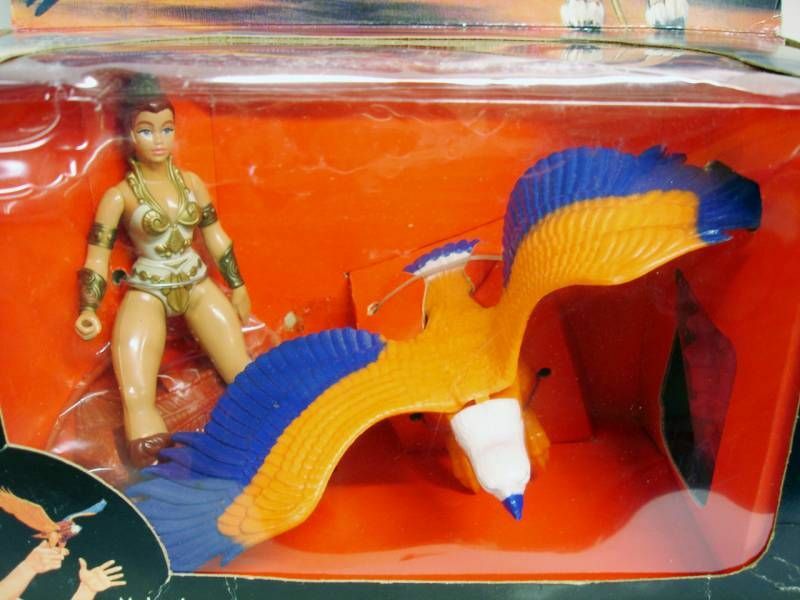 When in falcon form, she never wore the bomb pack that came with the toy. 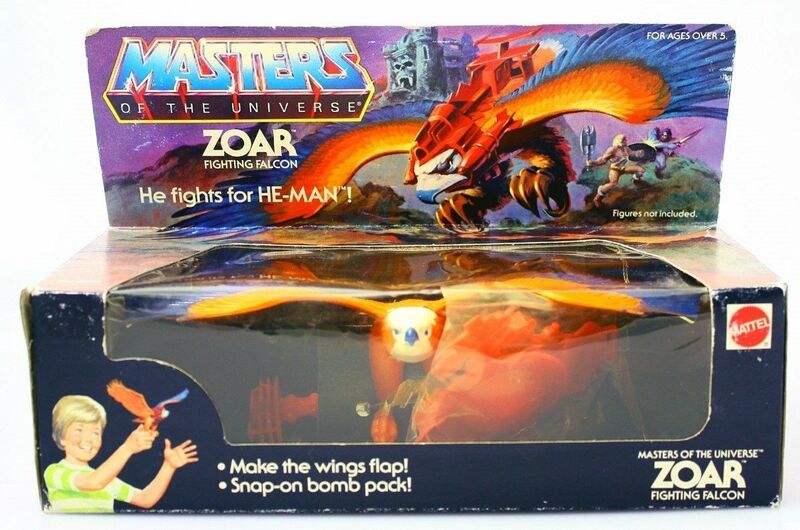 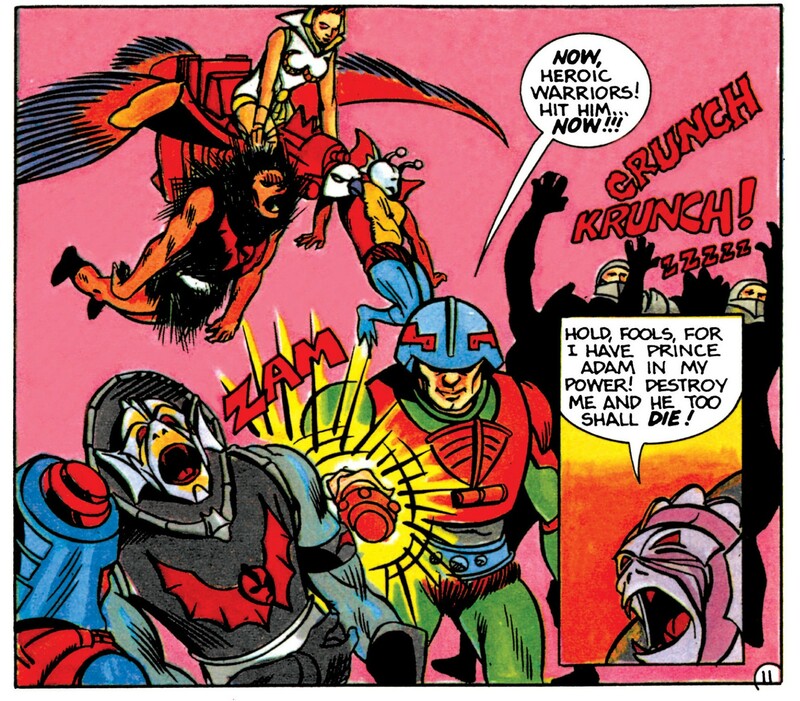 Like Battle Cat before him, Zoar’s existence is probably due to the desire to flesh out the MOTU toyline with minimal capital expenditure. 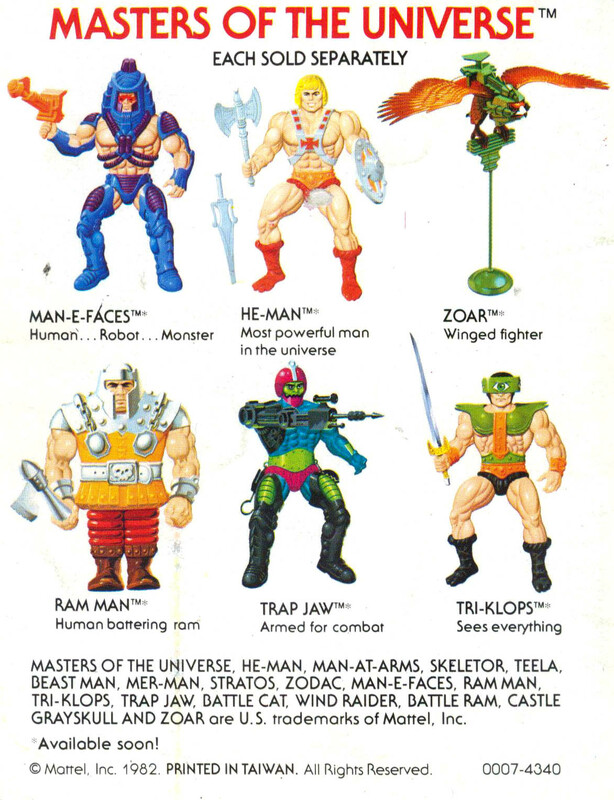 Despite the cheapness inherent in that philosophy, a lot of truly great figures came to us in that way. 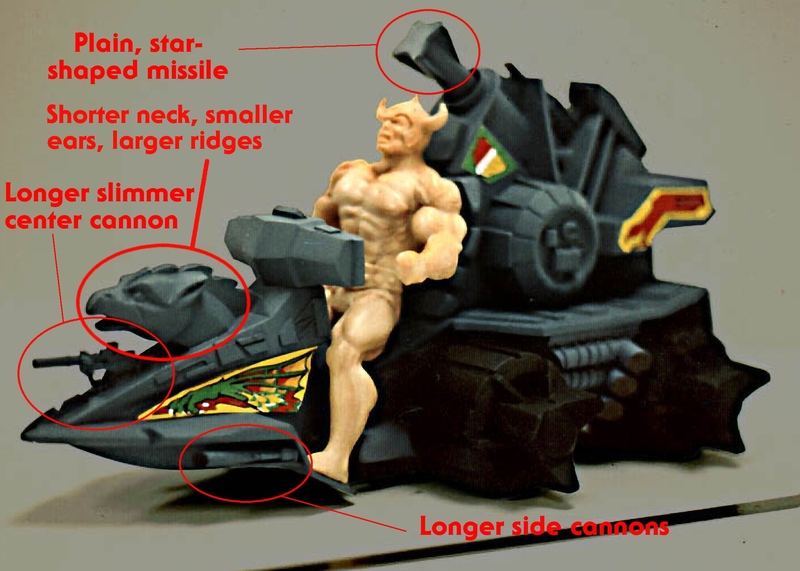 I think that says something about the creativity and ingenuity of the Mattel design team. 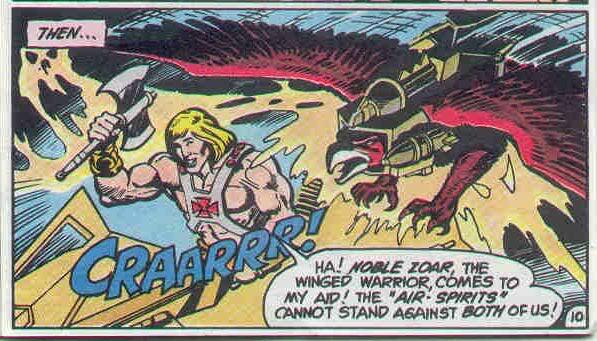 Zoar battles his nemesis Screeech in this illustration by R.L.Allen. 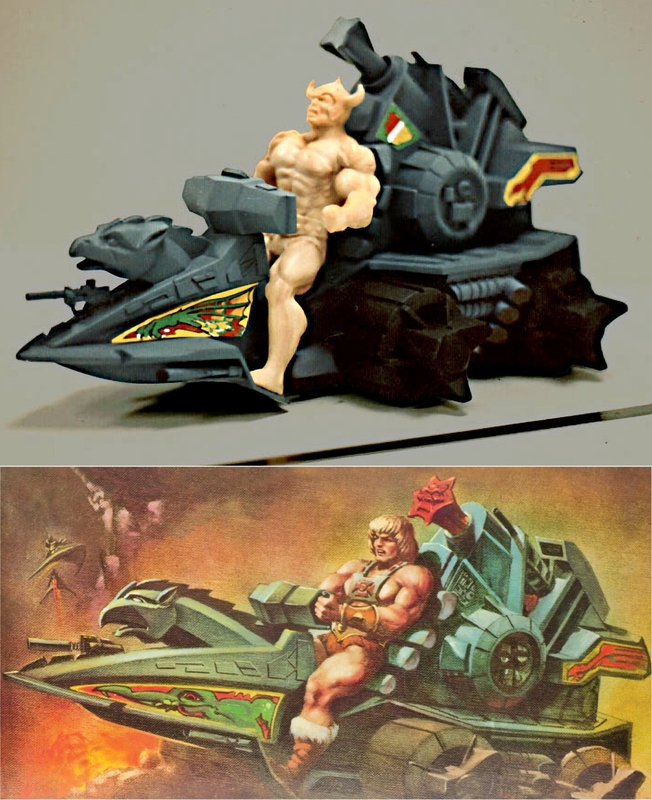 Special thanks to Jukka Issakainen for providing many of the images used in this blog post.